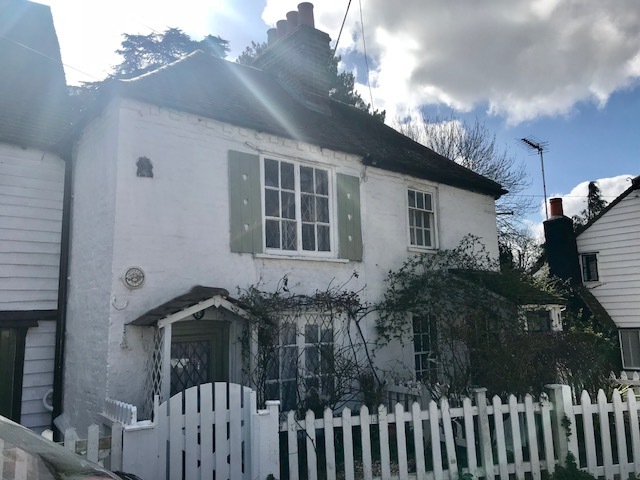 A delightful Grade II listed two bedroom character cottage with many original features set superbly in the heart of Cheam Village and with an easy walk to the local shops and station. Stepping through the front door into the cosy front room there is a feature fireplace with wooden surround and bespoke alcove cupboards and shelving on either side. Next into the kitchen and breakfast room with a range of modern fitted cupboards and shelving, there is space for a washing machine, fridge, and oven. The bathroom consists of a three piece white suite with overbath shower. Outside the pretty courtyard garden is private and secluded and roomy enough for a table and chairs and a storage shed. Upstairs the master bedroom has lots of charm and is light and airy with an original open hearth fireplace and plenty of space for wardrobes. The second bedroom is at the rear of the property and has large casement windows opening onto a roof top veranda with further storage housing the boiler. Tucked away as you leave this bedroom is a W.C. discreetly hidden by sliding doors. Situated in a sought after residential cul de sac, this pretty road lined with similar character period properties leads to the wide open space of Cheam Park and then onto the beautiful Nonsuch Park, a superb place for coffees and lunching in the quaint tea rooms, walking and bike riding. Also within a short walk you will find the local shops, restaurants and cafes almost on your doorstep. With Cheam BR station a 5 minute walk and good local transport this is an ideal property for downscalers or first time buyers alike, looking for the perfect village location.